Place chocolate in microwave-safe bowl and cook at 30 second intervals, stirring after each, until melted and smooth. 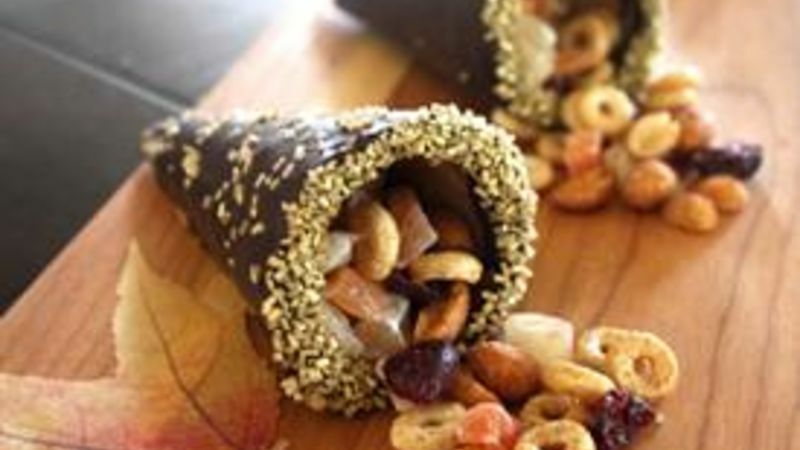 Roll outside of ice cream cone in melted chocolate. Dip the open end of the cone in yellow or gold sprinkles and place on wax paper. Add additional sprinkles to outside of cone, if desired. Combine Cinnamon Burst Cheerios™, peanuts, and dried fruit in a medium bowl. When ice cream cones have set completely, stuff with cereal mixture and place on a platter to serve. When you ask people what they looks forward to most at Thanksgiving you’ll usually hear “turkey” or “pie.” At our house, it’s all about the munchies! I usually adhere to a pretty strict meal and snack schedule, but Thanksgiving is the one day of the year that I let the kids munch all day. I put out all kinds of finger foods and they nibble themselves into a food coma. In addition to fresh fruits, crackers and veggie trays, I like to have out one fun sweet treat for the kids (and adults!). Take ice cream cones and dip them in melted semi-sweet chocolate. I found that the easiest way is to hold the cone right at the tip and roll it in the chocolate. Then, dip open end of the dipped cone in yellow or gold sprinkles. Lay on wax paper and use finger to smooth over the part where you were holding the cone. Add extra sprinkles, if desired. Let set completely (about 10 minutes) then fill with your snack mix. So easy! These would look gorgeous lined up on a wooden tray as the kids’ table centerpiece! Mandy Heaston is a busy mom, gourmet cook—and opera singer! Check out her member profile to see what she’s cooking up on Tablespoon. What are your favorite Thanksgiving munchies? We’d love to hear your ideas!